The Southern General Hospital or SGH is a very large teaching hospital in Glasgow with a maximum capacity of 900 beds. It is located on Govan Road in Linthouse in the south-west of the city and provides parking for 266 cars in a multi-storey car park. The Southern General Hospital provides medical services for the whole of south-west Glasgow, with specialty neo-natal, spinal cord injury and neuroscience departments. It offers a very wide range of services, both diagnostic and therapeutic, including Occupational Therapy, Physiotherapy, Speech Therapy, Podiatry and Radiotherapy. It also centralizes the in-patient Gynaecology service for all of South and West Glasgow offering a foetal medicine unit, ultrasound and maternity services. Its Maxillofacial and Dermatology Departments service the entire city as do the Assessment and Rehabilitation services for the Physically Disabled. If you are in need of a centrally located hotel between the City Centre and the West End of Glasgow, just a short drive from the Southern General Hospital, you will find The Sandyford Hotel an excellent choice. Our hotel provides 55 affordable rooms with B&B accommodation which will cater to your every need. Our bed and breakfast offers are cheap, but we don�t compromise on quality. All rooms are en suite, offer free Wi-Fi access and a full Scottish breakfast is included in the price. To make a reservation at The Sandyford Hotel, simply call one of our friendly reception staff today. We will be happy to answer any questions you may have, discuss your requirements and offer advice on available rooms. You can also contact the hotel with the help of the online reservation system on this website. 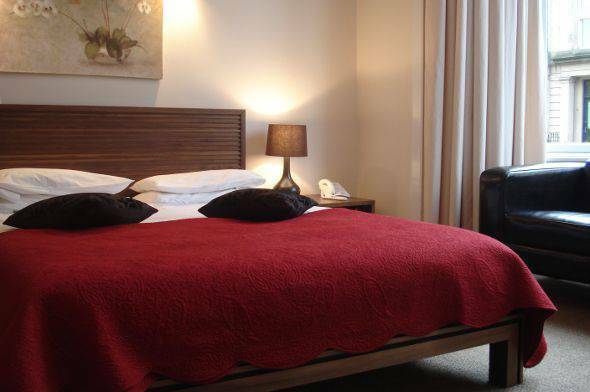 For Southern General Hospital accommodation, look no further than The Sandyford Hotel.